Smooth-feeding and reliable factory replacement Magazine for Ruger rifles. Our low price makes it the right time to stock up! 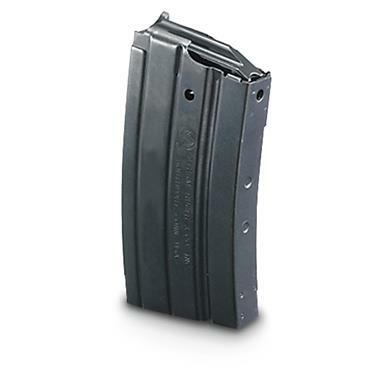 Ruger Mini Thirty, 7.62x39mm Caliber Magazine, 20 Rounds is rated 4.8 out of 5 by 8. Rated 5 out of 5 by ggleck from RELIABLE All the Ruger 20 round magazines have run perfect through my mini 30, you can't go wrong by getting these. Rated 5 out of 5 by Rick P from Excellent Magazine! It is the same as the two magazines that come with the rifle and they all perform flawlessly..smooth and dependable.. Rated 5 out of 5 by Mike from Fair price I have not use them yet , but I know they will work just fine , every thing Ruger make works . Made to exacting military specifications. 40 rounds of high-powered steel.